Hand #149 - Ben Ponzio has the button, he raises 250,000 more, Hewitt moves all in, and Ponzio immediately calls with . Hewitt shows , and he'll need to improve to stay alive. The board comes , and Ponzio wins the hand -- and the bracelet -- with king high. David Hewitt is eliminated in second place, earning $374,216. 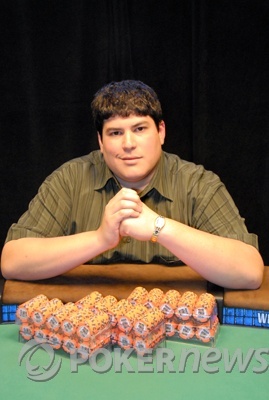 Ben Ponzio wins Event #25 ($2,000 No-Limit Hold'em), earning $599,467, a Corum watch, and a coveted WSOP bracelet. Hand #148 - David Hewitt has the button, and he folds. Hand #146 - David Hewitt has the button, he limps with 9-2, Ponzio raises with , and Hewitt folds. Hand #145 - Ben Ponzio has the button, he limps, and Hewitt checks. The flop comes , Hewitt bets 120,000, and Ponzio calls. The turn card is the , and both players check. The river card is the , and they check again. Ponzio shows to win the pot. Hand #143 - Ponzio button. They check down the board to the river, and Ponzio bets to win the pot. Hand #142 - David Hewitt has the button, he limps, and Ponzio checks. The flop comes , Ponzio bets 125,000, and Hewitt calls. The turn card is the , Ponzio checks, Hewitt bets 125,000, and Ponzio calls. The river card is the , and both players check. Ponzio shows to win the pot with a pair of queens. The holecam reveals that Hewitt had . Hand #141 - Ben Ponzio has the button, he raises with , Hewitt moves all in with , and Ponzio folds.